No, it’s not an economy class flight and you’re not buying a Maybach anytime soon cause they’re only for the super rich. This one is about the Mercedes-Benz E-class sedan. Now, you’re probably wondering why they’ve been popping up recently? Well, that’s because the Three Pointed Star has factories here now so they’re far cheaper than they were in the 1990’s and 2000’s where all cars were imported from Germany. I’m gonna be talking about the E300 because it’s got the same engine as the E200, a 2.0L Straight-4 but has nearly double the horsepower. Be advised, though, that both Merc and Bimmer sell mostly diesels in the Philippines. No idea why. The car, if you’ve been following Mercedes, looks exactly like the S-class. 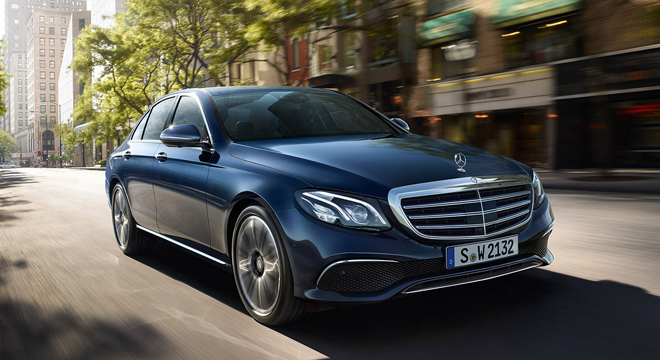 The E-class is considered a smaller brother of the S-class after all. And as such, has many of the posh features found on it’s bigger brother. IF you’ve got the money AND decided to pimp out your E300 with AirMatic suspension, you’ll be gliding through anything on the road. Speedbump! What speed bump? Pothole! What pothole? Such is the beauty of the AirMatic suspension; you’re flying a car. Oh, and the infotainment system? If you’ve bought the optional executive suite, you’ll have a 12 inch touchscreen instead of the 8 inch model. Both base and executive models have Android Auto and Apple CarPlay as standard. However, the infotainment swivel wheel isn’t as good as the BMW iDrive system. And you’re probably wondering about acceleration? It’s got 242 horsepower and 250 lbs-ft of torque and if you buy the optional 4Matic (4WD) gearbox, you can sprint to sixty from naught in just 5.2 seconds and on to a top speed of 155 miles an hour (250 kph). Also, many other optional features include lane departure warning, collision avoidance, autonomous emergency braking and 360-degree view. The list goes on, folks. And now, we go to the pricing. You’ll be surprised if I told you that the E200 is between PHP 4.4 to 4.8 Million. Considering that they used to cost PHP 6 to 8 Million, this is a steal.